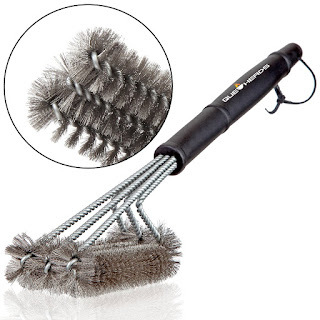 This is a TOP OF THE LINE bbq grill brush. It is a lot larger than I had anticipated. It is 18 inches. The way it is shaped, makes is super easy to clean your girl. The bristles get all the hard to reach spots on your grill. You don't even have to push very hard at all to get it totally clean. At the end of the brush, there is a loop where you can hang the brush if you would like. The handle is big too. So, your hands fit nicely around it. It is super easy to clean . I just put mine in the dishwasher and it comes out like new. You could also just wash with soap and warm water if you preferred. This would make a wonderful gift for someone who enjoys cooking out.